Kaltura's CaptureSpace Lite is a desktop recorder that allows user to record their screen, webcam, or voice. Before using CaptureSpace, it must be downloaded and installed. Note: You will only need to download the program once. 4. Select the appropriate Download button for either Windows or Mac and follow the instructions to install the program. 5. 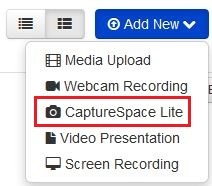 Return to the My Media area in Moodle, or launch CaptureSpace Lite from your desktop.